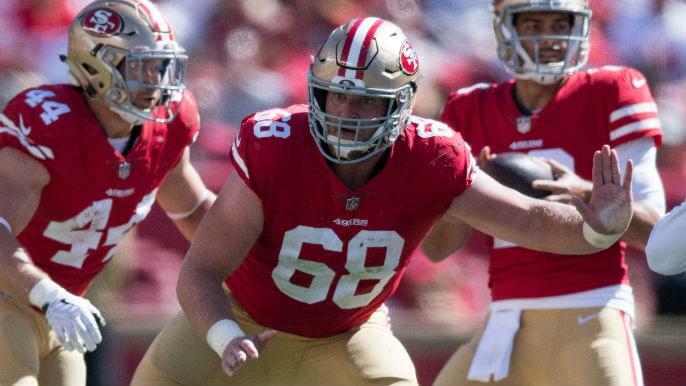 SANTA CLARA — One of the 49ers’ question marks entering the 2018 season is where, and whether, they would find production on the right side of the offensive line. The starting right guard spot featured the only open competition of training camp, and rookie Mike McGlinchey inherited the starting right tackle job without playing an NFL snap. In a season filled with disappointment through nine games, the performance of that right side has been one of the most positive breakthroughs. One-half of the production stems from an unexpected source: Mike Person. The 30-year-old signed with the 49ers near the end of their offseason program. He was brought in to compete with first-round picks Joshua Garnett and Jonathan Cooper, who started 13 games last year for the Dallas Cowboys. Earlier in Person’s career, he worried about whether he stacked up with the competition at his position. No longer. Cooper was ultimately released, and Garnett never quite shook the injury bug. Person was the most consistent throughout training camp and earned the starting job as a result. His season started on the wrong foot when he strained some muscles in the bottom of his foot in Week 1. Garnett substituted for him and promptly suffered a dislocated toe, keeping him out for the next four weeks. Person toughed through the discomfort and played the following week. He has not missed a game this year. He has slowly regained his health, while becoming one of the 49ers’ top players and contributing to its No. 4-ranked rushing attack. Pro Football Focus ranks Person as the No. 8 overall guard in the NFL through nine games. He has not allowed a single quarterback pressure in four of San Francisco’s nine games. Person shrugs off the praise. “(I am) just trying to perfect craft as best as I can,” he says. Person knows as well as anyone how quickly things change in the NFL. He has spent eight professional seasons with six different teams. He is on his second stint with the 49ers, which drafted him in the seventh round of the 2011 NFL Draft. He has signed four-year deals and one-year deals. He has been with teams for as few as nine days. Person says he was confident he would find another job in the offseason, despite his meandering career path. He was encouraged in his potential with the 49ers because he played in Kyle Shanahan’s system in Atlanta, albeit as a center. But “when you have been through the ringer,” says Person, he wondered whether he would ever find a permanent landing spot. He was just happy to have a shot with San Francisco. That’s why Person is not letting himself think ahead to the offseason, when he hits free agency. He is focused on finishing the season strong and experiencing the ride with teammates and coaches he enjoys working alongside. If he continues his high level of play, he won’t have to worry about long-term security.